Drs. Michael Sughrue of the University of California San Francisco and Charles Teo of the Centre of Minimally Invasive Neurosurgery in Sydney Australia have teamed up to deliver a current, comprehensive issue on minimally invasive intracranial surgery. 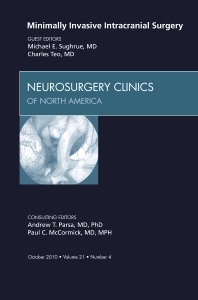 11 chapters cover all aspects of this type of surgery, including repair techniques, complication avoidance, and special considerations for movement disorders, tumors, vascular lesions and more.